Opinion: Could this be the start of a new era in WWE? Could this be the start of a new era in WWE? If you’re a die-hard fan of WWE, then please leave right now and read some other article because what I’m about to say will definitely ruffle some feathers among the loyal WWE Universe here at Sportskeeda. 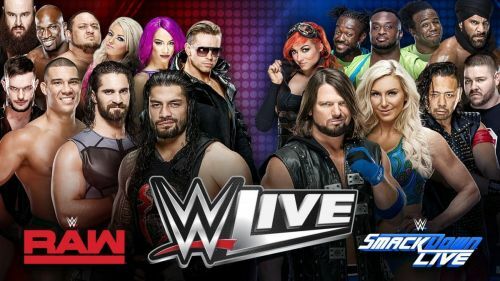 WWE have the biggest talent pool it has ever had in the company’s history with Superstars from RAW, SmackDown, NXT and now even NXT UK, yet WWE constantly turns to part-timers like Undertaker and Triple H in order to boost ticket sales. This could be due to Vince McMahon’s lack of belief in the NXT brand. Don’t believe me? Look at the numbers: Three out of the last four pay-per-view main events have featured part-timers (Undertaker, Triple H, Shawn Michaels, Brock Lesnar). Now, I love watching these guys wrestle in the ring, but I would also love to see the younger in-house talent being developed a bit more. It would make much more sense to push guys like Finn Balor, Kevin Owens, Sami Zayn, Shinsuke Nakamura, Samoa Joe etc. because these are the guys who are going to carry the company into the future. When Rock and Steve Austin left, WWE relied on its younger generation of wrestlers (John Cena, Randy Orton, Batista, Edge) to carry the company on their shoulders, and we can all agree that they did a pretty good job. This is something they can try to do with their current talent who are seasoned campaigners. The big problem with relying on just a handful of wrestlers is that if one person is injured, it just messes up the order. Roman Reigns’ returning Lukemia is a case in point. Him being out with an injury has resulted in WWE putting the belt back on Lesnar since WWE felt they didn’t have much of an option (it was either Lesnar or Strowman). What baffles me even more is the fact that they decided to do this by squashing “The Monster Among Men” in 3 minutes and 16 seconds. The least they could’ve done is have Braun Strowman put up a good fight against Lesnar. But, I guess I shouldn’t really be surprised since this isn’t the first time they tried to make “The Beast Incarnate” look unstoppable by having him victimize his opponents mercilessly. WWE have pushed themselves into a corner by doing this because it’s gotten to a point where I just can’t imagine any of the current wrestlers who can actually overthrow Lesnar and become the new Universal Champion. This is one of those instances where I hope I’m wrong. Brock isn't the only part-timer I’m going to scrutinize. There is one other wrestler whose character should have retired long ago - The Undertaker. For the past couple of years, WWE have relied on the “Deadman” to boost WrestleMania ticket sales. Despite the fact that The Undertake performs at his best on “The Grandest Stage of Them All”, it’s suffice to say “The Phenom” has seen better days. While we’ve had some memorable Undertaker matches, he should’ve retired after his streak ended. Instead we get to see his recurring appearances that have only made him look weaker with each passing year. I get that “The Deadman” is one of the most loved superstars in WWE history, but even he is getting older as days pass by and this has become quite evident in his matches. He is now a shadow of his former self, and it’s becoming depressing to watch him wrestle in denial. But, why does Vince McMahon and WWE constantly rely on their part-timers? This could be because Vince reportedly does not like NXT. I know this sounds like a lame reason, but it kind of makes sense. Out of the all the NXT Superstars who graduated to the main roster, how many have actually held World Championships? The Shield are the only trio who come to mind. Austin Aries, Bobby Roode, Asuka and Kevin Owens. What do all these wrestlers have in common? They were hugely successful wherever they went including NXT, but only Kevin Owens and Finn Balor went on to win World Championships (albeit for a brief period) on the main roster. A great example would be Asuka who was treated like an unbreakable wrecking machine in NXT, but hasn’t been involved in any noteworthy storylines on the main roster. Despite that, she is the most over women’s wrestler in the entire company. What troubles me even more is the fact that some Superstars have gotten pushed out of nowhere when they didn’t do anything to deserve it in the first place. Irrational decisions like these resulted in Jinder Mahal becoming WWE Champion seemingly to boost ticket sales of WWE’s India tour. WWE’s bad booking isn’t just limited to their talent, but extends to their storylines as well. Storylines just seem to start and end out of nowhere without any flow. This lack of fluidity has me confused and perturbed. In case you don’t agree with me, let me refresh your memory. Dean Ambrose betrayed Seth Rollins and attacked him week after week, and then he (Seth Rollins) is booked to face Shinsuke Nakamura at Survivor Series in a champions vs. champions match. Momentarily, he has to put his feud with “The Lunatic Fringe” on pause and feud with Nakamura only to resume it (his feud with Dean) after Survivor Series. It would have made more sense if Dean had betrayed “The Kingslayer” at Survivor Series. It would have made for a great story and would have shocked everyone. Let me give you another example. When Samoa Joe was injured, Daniel Bryan became number one contender for the WWE Championship. Before that rivalry finished, Samoa Joe returned and resumed his feud with AJ for one more match which made absolutely no sense since he was already booked to lose. The following week on SmackDown, AJ Styles lost his Championship to Daniel Bryan. Does this ring any bells? Oh yeah! It’s exactly what happened last year before Survivor Series. It’s pretty much the same story remastered with different wrestlers. This is what I’m talking about. Lack of creativity and direction has resulted in lackluster gimmicks, rivalries and storylines that no one cares about. This is also affected matches where WWE is just failing to receive the crowd reactions they used to get. While NJPW are delivering quality 5-star matches on a consistent basis, WWE is struggling to keep up. In fact, the best match that WWE delivered this year was Becky Lynch VS. Charlotte Flair at WWE Evolution, and it didn’t even crack the top 10 highest rated matches of the year. Vince is responsible for delivering so many unforgettable moments before, and it’s no doubt he’s a creative genius. But, 20 years of creating characters, gimmicks and storylines has taken its toll on him. Eventually everyone loses their creative flair, and Vince may be losing his. But its ok because Vince has Triple H in his corner. He (Vince) could just hand over the reigns to Triple H who has proved more than capable with his involvement in their NXT brand. Triple H in the creative seat could mean that we could all breathe a breath of fresh air once again. I don’t even mind paying for the WWE Network, but I need to get a product that’s worth my investment. I need to see those breathtaking matches and larger than life characters that I used to see in the attitude era. I just want the old WWE back that featured these larger than life characters, gimmicks, storylines and exhilarating matches. I want to see the WWE that made me fall in love with wrestling; the same WWE that made me want try those wrestling maneuvers with my friends. I want to jump off my couch screaming in excitement. It just troubles me to see what this company has become. I hate to see the brand I love so much being outperformed by other promotions. I know most of you won’t agree with me, but I would still like to hear your thoughts on this subject. Note: The above thought are my opinions based on what I've observed for the past year and a half.